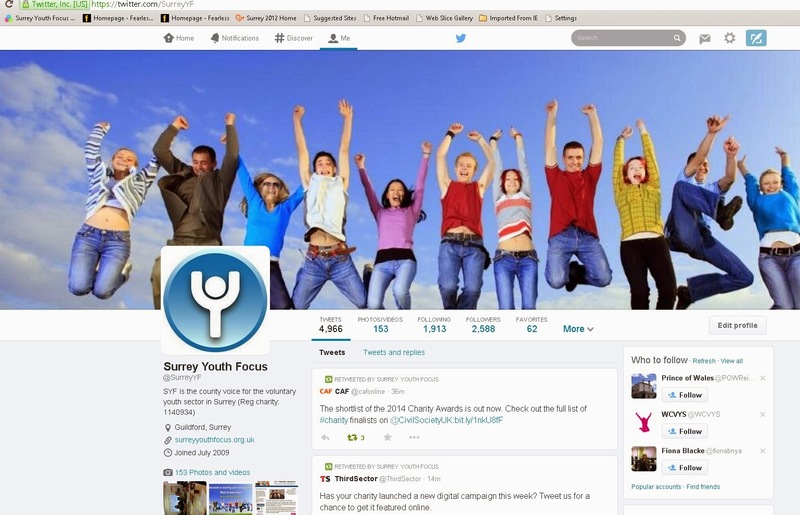 A great week - Trustees on Tuesday evening and excellent presentation on marketing of Surrey Youth Focus by our new Marketing and events manager. Our member benefits are outstanding in my view, as a result of long term agreements with Surrey Chamber and BitC whereby businesses come to us to find volunteering opportunities. Our SYF details are going into every Chamber marketing pack for example. Our COMMUNILAB project is moving forward positively, and excitingly. Trustees approved our Annual Report and Accounts, Business plan and discussed the “Big Assist” consultant’s report about the evolution of SYF. This was quite a lot to take in, and Trustees have agreed to have awayday on this specifically. The point is to plot the future direction of SYF over the next, say 3 years. Excellent meeting on behalf of The Youth Consortium with Surrey and Downs (NHS) Partnership Trust about the mental health training of youth workers. The Consortium is bidding to grant-making trusts for this, and the NHS Trust were interested in, and supportive of the bid, and may wish to be more closely involved. I am in discussion with Surrey CC about various property matters of strategic importance. Important meeting next week with possible GMT funder, and with Surrey Deputy Police Commissioner, but I need to use August to focus on internal staff structure, and advance our Pqasso Lvel 2 preparations. “Social capital” are words I’m hearing more about as strategically the Government sector shrinks, and, very interestingly even my beloved /irritating Church of England starts talking about credit unions as a good alternative to payday loan companies. Of course in the 19th century so much more of social welfare was run by churches/philanthropists..certainly a major role for the charity sector. CEO returns, and is sent away? Well I’m back from nearly 3 weeks holiday in SW France – a week on the beach at Banyuson the Med as close to Spain and the Pyrenees as you can get, and a second week in a medieval bastide (fortified) village near Gailac/Albi (north of Toulouse, and our favourite place. Besides lots of swimming, I read 3 theology books (Meister Eckhart-medieval theologian, John Cassian-monk, and Evelyn Underhill - 20th cent mystic. BUT the boss was not impressed and I was accused of lacking emotional intelligence ..so I read her books (not allowed her Kindle) and read: Anne Tyler – The Beginners Goodbye, Mark Haddon - The Red House, The Strange Pilgrimage of Harold Fry, and A day in December by Sebastian Foulkes. All superb (especially The Red House). Otherwise, when I go away the UK bakes in sunshine, and wins everything on the sports front – Lions rugby, first Test match, Murray at Wimbledon, and looks like Froome to win the Tour de France. So any chance of a whip round to send me off on holiday again? On the work front we are launching our new website shortly – by next Monday or sooner, and there is a stack of work going on both strategically and operationally – more next week. It is indeed good to be back! Really! !